If single bond type is selected in the toolbar, clicking on an existing bond will increase the bond type from single to double to triple and back to single bond. 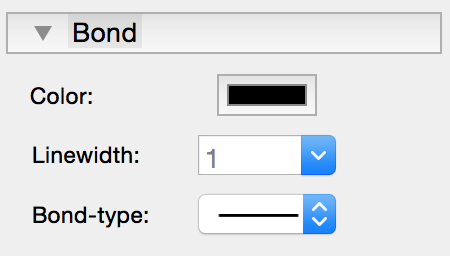 If double bond type is selected in the toolbar, clicking on an existing bond will change it to a plain double bond. Clicking on an existing double bond will change the appearence of the double bond from plain to upper bar and lower bar double bond. If stereo bond type is selected in the toolbar, clicking on an existing bond will change it to stereo bond. Clicking on a stereo bond will change it’s direction. By right-clicking on a bond or by right-clicking on selected bonds a popover is shown where you can change the attributes of the selected bonds.